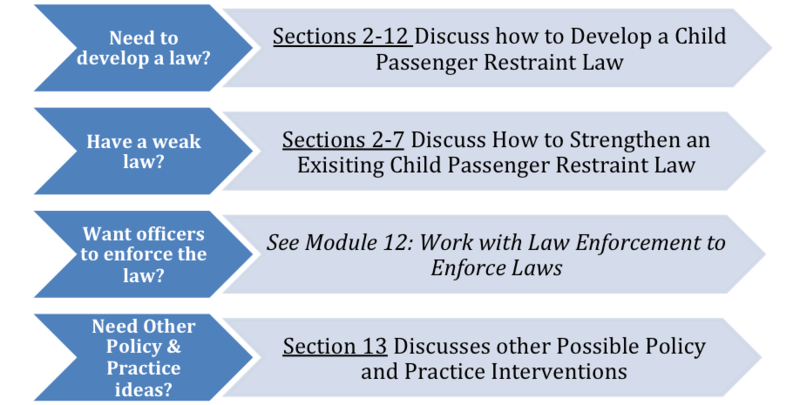 This module will help you learn how to develop laws, strengthen existing laws, and work with police officers to enforce child passenger restraint laws in your community. Throughout this module, you’ll get personal advice from three CPS Techs/Site Coordinators who implemented a law change and law enforcement intervention. Hi I’m Becca, and I am an enrolled member of the Confederated Tribes of the Colville Reservation in Washington State. I have been working with Native CARS since 2010. While I didn’t help design the interventions established by Native CARS for the Colville Reservation, I implemented several of them over a year and half time period. I specifically worked on the Law and Order Code intervention when Bernadine was unable to head the project. My specialty by way of education is biological sciences, and until I wrote the Colville’s child seat law, I had no experience with code writing. Through research and collaboration I was able to draft the Colville’s child seat law, of which was established in August of 2011. I’m married and mother of three active boys under 12 so presently I have three kids in the back seat from rear facing to booster. Hi I’m Bernadine. I am a member of the Confederated Tribes of the Colville Reservation and have been with the Native CARS Study since Fall 2009. Being a seat belt user of over 25 years, it was pretty easy to promote car seat safety through the Native CARS Study. One lasting success working on the Native CARS study was the passing of a Colville Tribal Child Restraint Code in May 2011. I’m married to Brian Phillips, a retired law enforcement officer and have two pups. I enjoy time doing cultural arts such as basketry and beading. Hi I’m Iola Hernandez. I am a member of the Shoshone-Bannock Tribes and have worked for my Tribe for over 30 years on the Fort Hall Indian Reservation in Idaho. My newest project is working with the Native CARS Study as a CPS Technician in the Health Education Program, where I lead efforts to get a seat belt law for our Tribe as well as oversee the distribution of car seats to parent or caregivers of children who are seen at the Tribal health clinic. With two daughters, three grandkids and now one great-grandchild, I have been keeping children that are close to my heart safe in vehicles for three generations.